The cricket World Cup, since its inception in 1975, has been the centre of some of the most thrilling clashes in the history of ODI cricket. There is that extra intensity in a World Cup game. The best competing for the ultimate title. World Cup 2019 is now less than a 100-days away. And with only 10 teams competing, the tournament is definitely set-up to be more intense, with a lot more thrilling games than the previous editions in the recent past. As we wait excitingly for the 2019 World Cup to begin, let's go down the memory lane to relive some of the most thrilling games in World Cup history, the ones which went down to the wire. It was Match 37 at St. George's Park, Port Elizabeth of the 2003 World Cup. At stake was England's place in the super-six and they were up against arch-rivals and the mighty Australians. Nasser Hussain won the toss and preferred defending a total over chasing one. 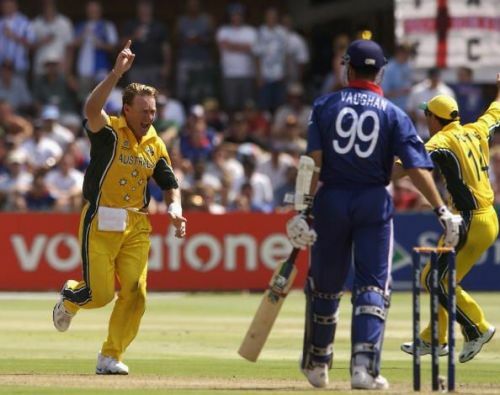 His decision to bat first went well until Andy Bichel was introduced into the attack. After that, the English scorecard went from 66/0 in 9.4 overs to 87/5 in 17.5 overs. With some gutsy resistance from Flintoff and AJ Stewart, England managed to go past 200 and posted a target of 205 for the Australians. Andy Bichel finished with 7 wickets in his 10 overs, giving away only 20 runs. The chase proved to be all but easy for the Australians, courtesy Andy Caddick. The Australians were reduced to 48-4 inside 9 overs. The top 4, all falling to Andy Caddick, who seemed to have emulated his namesake in the opposition. At the end of the 38th over, Australians were 135-8, needing 69 more runs. It was Michael Bevan on one end, but it seemed that he'll eventually end up being short of partners on the other end. But, Andy Bichel was far from done for the day. Both started moving steadily towards the target while the English supporters kept eagerly waiting for the couple of wicket deliveries which never got bowled that day. It came down to 14 in the last 2 overs. Andy Bichel scored a six and a four, and only 2 runs were needed off the last over. The first 2 balls of the last over were dots, but the game was not up for any more surprises. So, Michael Bevan just crashed the 4th ball into the boundary, and along with it the English dream of winning a World Cup, for four more years.